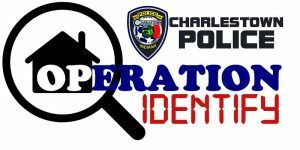 The Charlestown Police Department’s OPERATION IDENTIFY is a Crime Prevention initiative that serves more than one purpose in preserving personal property. Using the easy steps of Operation Identify, property owners can take proper inventory of valuable items and not only be better prepared to help law enforcement get valuables back if ever the unfortunate victim of crime; but also if becoming a victim of a natural disaster or accident, having an inventory can allow you to file insurance claims for your items quicker. A Operation Identify property record involves documenting on one form, the manufacturer make, model, and serial number of valuable personal property around the home; placing engraving an ID or serial number on valuable items that do not bear a serial number. Completing an Operation Identify property inventory is also a great time to video your personal property in each room and take a photograph of the valued property…..especially items such as jewelry and collectibles which do not bear a manufacturer’s serial number. Using a video and taking photos increases the ability to properly identify recovered stolen property; as well as, prove its condition and existence in your home. Taking inventory is an important process for both homeowners and businesses. Electronics, jewelry, gold, silver, and any item that has value. Personal belongings, valuables, memorable home items. Firearms, antiques, collectibles and small appliances. Televisions, DVD players, stereos, cameras, microwaves, automobiles, bicycles, watercrafts, motorcycles, electronics, artwork, antique furniture, books, and basically any item of value that can be re-sold and is high in price. It’s as easy as 1-2-3! First, plan a day dedicated to going room to room, and out building to garage, at your home for completing a valuable property inventory. 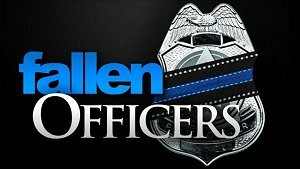 Second, use a Charlestown Police Department Operation Identify form by CLICKING HERE to download and print as many of the forms thought to be needed. Lastly, keep your completed Operation Identify property inventory in a safe place, and accessible if needed. Save time, be more prepared, and photocopy your completed Operation Identify property inventory for delivery to your property insurance agent, and even the Charlestown Police Department for safe and confidential storage until needed. For more information or to inquiry of any questions regarding this program or any other crime prevention tips, feel free to contact the Criminal Investigations Division of the Charlestown Police Department at 812-256-7770.